Saint-Saëns' passion for historic subjects led him to delve into library archives and plunder early music at times creating an idealised rennaissance style to match his operas’ themes. These exquisitely orchestrated musical jewels; ballet divertissements embody the essence of good taste and refinement beloved of belle époque France. Guillaume Tourniaire imbues this lost music with the greatest energy, love and life-force. Elan indeed! Saint-Saëns composed thirteen operas, yet with the exception of Samson et Dalila few of them have been favoured with modern revivals, and they remain a largely unexplored continent. He was such a gifted and intelligent musician that nothing he wrote was ever ineffective or incompetent; there are thus many thousands of pages—of chamber, choral, and orchestral music as well as operas—that can give intense pleasure when unearthed and brought to life for a modern audience. To assemble a selection of orchestral music from the unfamiliar operas is to confront a treasure-house of colourful and expressive music reflecting the tastes and fashions of belle époque France. Saint-Saëns had a distinctly spotty relationship with Paris’s opera houses and was usually happier working for enterprising impresarios in other cities. His first opera, Le timbre d’argent had to wait a dozen years before it was performed, largely because he had to overcome the widespread belief that virtuoso pianists who composed symphonies and chamber music (the category to which he was assigned) could not possibly compose an opera. Samson et Dalila was similarly spurned by Paris and after ten years was eventually staged under Liszt’s patronage in Weimar. Seeing these two works finally performed inspired Saint-Saëns to compose a series of grand operas in the years 1877-88. Etienne Marcel appeared in Lyon in 1879, Henry VIII at the Paris Opéra in 1883, Proserpine at the Opéra-Comique (although it is far from being a comic opera) in 1887, and Ascanio at the Opéra in 1890. None of these four had any lasting success. In later years he preferred to work at the open-air theatre in Béziers in southern France or for the elegant opera house in Monte-Carlo, where his last three operas were staged. Saint-Saëns admired Wagner but regarded his style as something to be avoided, nor was he drawn to Verdi’s full-blooded, high-octane style. He would always insist on sounding French by cultivating a more restrained, tasteful manner, with fine craftsmanship always uppermost. Ironically, it was Massenet who captured French audiences most successfully at that time by pursuing very similar goals, while Saint-Saëns laboured enviously to emulate Massenet’s sure touch and constant success. Although he lived well into the 20th century, he refused to follow the path to modernism, scorning Debussy’s Pelléas et Mélisande and Puccini’s veristic dramas. He took infinite pains with word-setting and orchestrated with great clarity and skill. He was supremely sensitive and intelligent, yet success in the theatre eluded him. Only Samson, with its origin as oratorio and its unmistakable leaning toward Wagnerian intensity, has kept an interest in his operas alive. Yet they are full of fine music, both vocal and instrumental, the latter of which is well represented here. Henry VIII met Saint-Saëns’s longstanding fondness for historical settings, in this case the renunciation of Henry’s first wife Catherine in favour of Anne Boleyn. The interaction of Henry’s political ambitions and his defiance of Rome with the jealousy of the two queens makes fine operatic material. The final confrontation of Catherine and Anne, like the meeting of Elizabeth I and Mary Queen of Scots in Donizetti’s Maria Stuarda, is poor history but excellent theatre. Saint-Saëns immersed himself in the subject and obtained a theme from the Royal Library at Buckingham Palace to use as a main motif. First performed in 1883, the opera has been revived a few times in recent years, but has far to go before it can rival Samson in popularity. Act II closes with a ‘Fête Populaire’, a sequence of seven dances of which two are included here. The Gypsy Dance (Track 1) opens with an exotic beat and an even more exotic melody, leading to a feverish waltz in the minor key. The ‘Fête du Houblon’ (Track 2) celebrates hop-picking season, but instead of riotous beery music Saint-Saëns represents this with a slow, elegant melody which loses its elegance towards the end when the horns and cymbals restate it with, perhaps, a few jugs of ale in their bellies. Ascanio is set in Paris in 1539, recounting an incident during the sculptor Benvenuto Cellini’s stay at the court of François I. 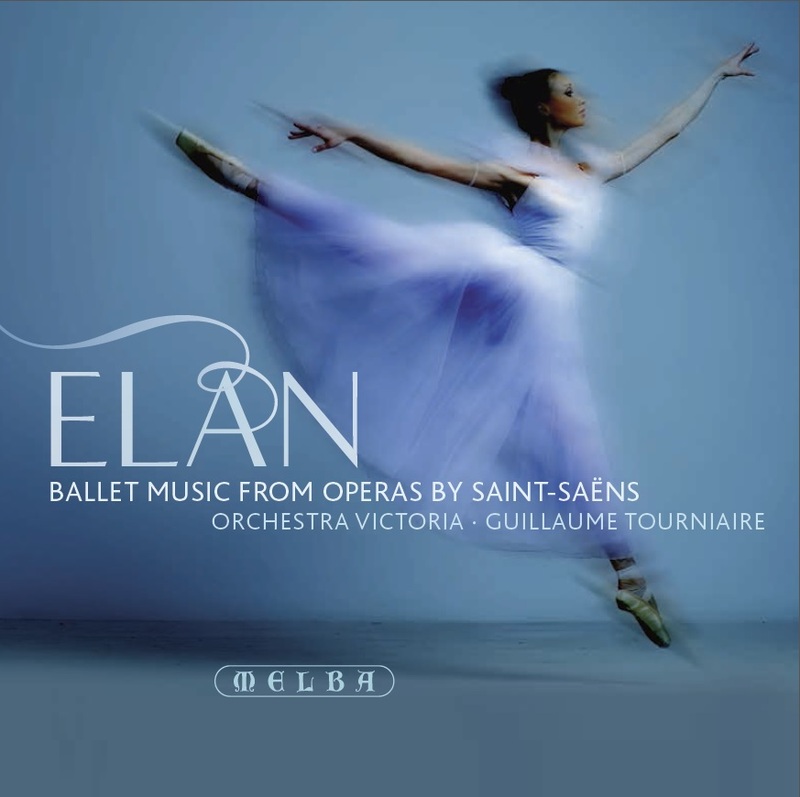 To enhance its period character, Saint-Saëns introduced a lengthy divertissement in the third act in the form of an elaborate entertainment in the gardens of the palace of Fontainebleau for the kings of Spain and France. Splendid sets, a stage full of elegantly costumed dancers, and a long sequence of colourful music was required. Some dances adopt an imagined baroque style, a taste shared by Delibes, Massenet and other French composers at that time. Saint-Saëns was here consciously imitating Rameau, many of whose works he was later to edit. The Maître des Jeux (Track 3) gives the signal for the entertainment to begin. This consists of twelve short dances, in which the gods and goddesses of antiquity make their appearance, along with their retinues. The goddesses Venus, Juno and Pallas Athene enter to an elegant baroque movement (Track 4). Diana’s similarly archaic entrance with the Dryads and Naiads is announced by a distant horn (Track 5). Bacchus is naturally rambunctious (Track 6). Several of the dances, beginning with that for Phoebus-Apollo (Track 7), are prefaced by a dignified rising phrase to accompany the appearance of a god: in turn Phoebus-Apollo (Track 7), Cupid (L’Amour) (Track 8), and Psyche (Track 9). Phoebus-Apollo’s music includes a tune taken from Thoinot Arbeau’s treatise of 1588 Orchésographie and better known from Peter Warlock’s Capriol Suite. Cupid’s dance is in the modern style (think of Coppélia). Psyche enters to the same rising phrase as Phoebus, then dances with Cupid to a lovely theme on the flute gently supported by the harp. Castanets and a bouncy Neapolitan rhythm bring the full ensemble into the dance (Track 10 ).Cupid’s variation (Track 11) is a brilliant solo for the flute, with solo cello in response. Then the drama intrudes when Cupid, instead of awarding the golden apple to either Venus, Juno or Athene, gives it instead to the Duchesse d’Etampes (Track 12), main source of intrigue in the opera itself. The last dance before the final Apotheosis (Track 14) is a lively modern waltz led off by a trumpet (Track 13). Reynaldo Hahn described this ballet sequence as a ‘supreme triumph of taste and elegance—the entire Renaissance in a few pages’. Ascanio was played at the Paris Opéra in 1890, revived there at Saint-Saëns’s death in 1921, but never staged since. Etienne Marcel has fared no better. Its first performances were in Lyon in 1879, with appearances in Paris and Rouen soon after, but it has lain in obscurity since then. Saint-Saëns and his librettist Louis Gallet hoped that it might be a kind of Parisian anthem, since it was inspired by the rebuilding of the Hôtel de Ville after its destruction by the Commune in 1871. Etienne Marcel, whose fine equestrian statue now stands close to that building, led an unsuccessful revolt against the Dauphin in 1358 and was murdered soon after. The complicated plot includes all the paraphernalia of grand opera, including a ballet that introduces Act III. Popular rejoicing includes an entertainment of six dances, starting with a noisy entry for students and bawds (Track 15). The Musette guerrière (Track 16) is an appealing dance over a drone pedal. As in Ascanio, there are archaisms (the Pavane), (Track 17) as well as a modern waltz (Track 18). The gypsy dance combines a loud, grand section for the men, followed by a lively triple-time dance for the gypsy girls, and the finale brings the full company on stage. Les Barbares, composed in 1900-01,was intended for outdoor performance in the magnificent Roman amphitheatre in Orange, although it was never in fact heard there. That theatre is also the setting of the opera’s bloodthirsty tale of conquest, sacrifice and revenge set in 105BC in a libretto by Victorien Sardou, the author of Tosca. The conflict between Gallo-Romans and Barbarians appealed to Saint-Saëns as an allegory of the tension between France and Germany which grew relentlessly following the humiliation of France in the Franco-Prussian War of 1870. He developed an unforgiving resentment of Germany as the years went by and was relieved, as a very old man, to witness French victory in 1918. There is a sombre colour to the music, already heard in the Prologue (Track 21), which builds to a climax before relaxing with a hymn to Venus (violin solo) later to be sung by the two women in Act II. Some distant fanfares introduce its vigorous second half, which again relaxes for Livie’s song (trumpet solo) swearing vengeance for her husband killed in battle by, it turns out, the man whose soft heart has spared the Gauls from massacre at the hand of the brutal Germans. At the start of Act III the Prelude (Track 22)prepares us for a scene where the astonished Gauls have been spared by their conquerors, unaware that their freedom has been bought in the previous scene by Floria, the Vestal Virgin, casting off her vows in the arms of the barbarian chief. Soon after, as the barbarians depart, a celebration is called for, always represented in French opera by a ballet (Tracks 23 & 24). This is in a lively Polonaise rhythm with two neatly balanced tunes heard first separately, then together.